Loan of Christian literature and magazines. William and Colleen Dedrick made their home in beautiful rural Washington State, where they raised their two children, now grown up. 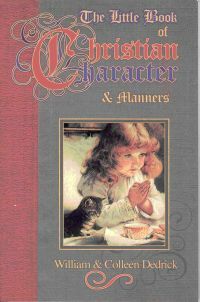 The Dedricks first published The Little Book in 1985 out of a desire to share their discovery that well-mannered children of strong character can be reared in this age of self-indulgence. is intended not to be an exhaustive child-training manual, but to provide a framework upon which to build standards for discipline and manners in your home. A good case could be made out for believing that repentance is one of the least used words in the Christian church today. In a world that will not tolerate the mention of sin, and in churches where it has been defined only in sociological terms, the biblical teaching on repentance has inevitably been ignored. Only occasionally has a book or booklet been published, or a sermon preached, on the theme. Here, writes John Murray, we have the theology of evangelism, and evangelism without scriptural theology has lost its moorings. R. B. Kuipers writing, as his preaching and lecturing, was always characterized by clarity and simplicity. The book begins with God as the author of evangelism, and shows the relation of his love, election, covenant and commission to it. There are chapters on the scope, urgency, motive, aim, agent, approach, means, message, method, effectiveness and triumph of evangelism. Dr. Kuiper also deals with zeal for, co-operation in, and resistance to evangelism. In these five powerful messages based on verses selected from the first chapter of the Book of Romans, Dr. Lloyd-Jones boldly confronts a fragmented world with the authority of the Gospel. He calls for a renewal of the church and challenges Christians to restore the self-discipline that strengthened the early church. Although the chapters initially were lectures in Edinburgh during World War II, these rich expositions speak pertinently and forcefully to Christians today. Many are the Christians who have been converted from a background of the Chinese Religion. Being first-generation Christians, they face with many problems with their unconverted families. Help from Christian quarters concerning how to live the Christian life within the Chinese culture is hard to come by. It is hoped that this book will be of help to them. The Christian who is from a different religious background in which idol worship is practised may find this book helpful, too. He is one of the most frequently mentioned figures in history. The letters he wrote nearly 2,000 years ago are still read by millions every day. He is quoted, argued about, attacked and defended. But who was Paul the Apostle? For many people he is a shadowy figure, rather than a real, flesh-and-blood person. We have come to the best of Norwegian Christian piety when we discover Ole Hallesbys Prayer. Instinctively we sense that here is someone who understands prayer. E understands its complexity and he understands its simplicity. Best of all, he helps us understand these things well. As not a bone of Him shall be broken, so not a word shall be lost. The Holy Spirit took special care that each of the sacred utterances should be fittingly recorded. Our Lord in His death-cries, as in all else, was perfection itself. There is a fullness of meaning in each utterance which no man shall be able fully to bring forth, and when combined they make up a vast deep of thought, which no human line can fathom. Here, as everywhere else, we are constrained to say to our Lord, Never man spake like this man. Amid all the anguish of His spirit His last words prove Him to have remained fully self-possessed, true to His forgiving nature, true to His kingly office, true to His filial relationship, true to His God, true to His love of the written Word, true to His glorious work, and true to His faith in His Father. Become what you were meant to be  a Christ-enclosed Christian. Discover how to draw on all the resources Christ offers you for living in a world of lacks, insecurities and hostilities. Find out what its like to live within His circle of strength. Enrich your circle with the practical advice in this book for a fuller expression of your life in Christ. Encouraging one another is one of the most dominant themes in the New Testament, both in the process of starting churches and building them toward maturity. The basic concept is used over 100 times in the Book of Acts and the Epistles. We cannot grow spiritually as we ought to in isolation from one another. We need to be supporting each other in love and prayer. One way to demonstrate our concern is by encouraging one another. Are you happy in your Christian life? Do you experience the freedom, power and joy which God promise His people? If not, you may well be suffering from the common complaint of 'Spiritual depression'. In this book, the author shows how those who are discouraged or depressed can learn to cope with themselves, conquer their problem and be renewed and restored to spiritual health and strength. By Richard L. Pratt, Jr.
My prayers never seem to go anywhere. If that sounds like you, here is the help youve been looking for. Richard L. Pratt, Jr., knows the burden many of us carry because of inadequate prayer lives. In this instructive yet often entertaining book, he offers clear biblical direction on how to pray more effectively. With remarkable care and balance he discusses key issues: from fascination with God to honest confession of our deepest needs, from concerns over form and freedom in prayer to questions about body language and fasting. Pratt tackles head-on the issues that can puzzle us the most. (2 Pet 3:5). Besides being founded on sound theology, this book also relates to contemporary scientific knowledge. The basis of Dr. Whitcombs argument is that the Bible is the word of God, recording catastrophic events for our learning and edification.